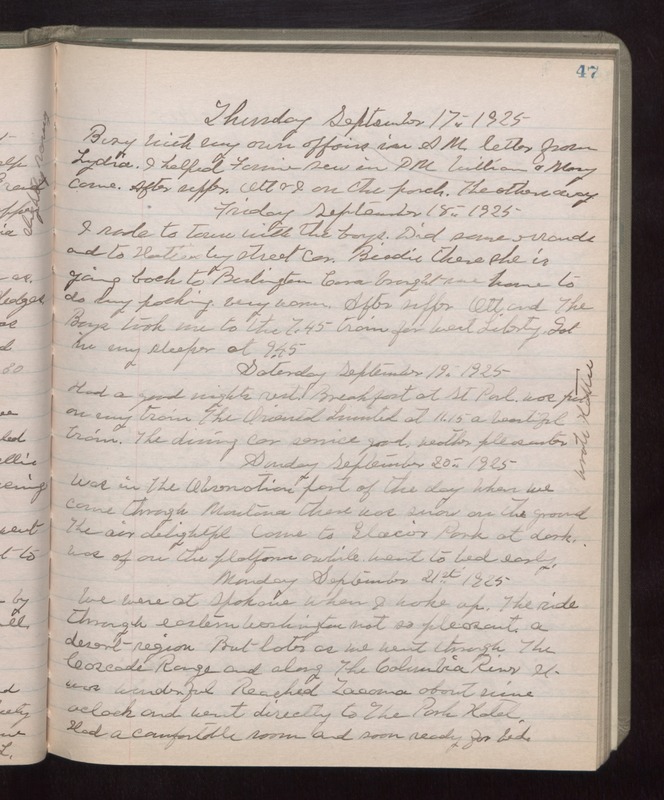 Thursday September 17th 1925 Busy with my own affairs in AM. Letter from Lydia. I helped Fannie sew in PM. William & Mary came. After supper Ott & I on the porch. The others away. Friday September 18th 1925 I rode to town with the boys. Did some errands and to Hattie by street car. Birdie there. She is going back to Burlington. Cora brought me home to do my packing. Very warm. After supper Ott and The Boys took me to the 7.45 train for West Liberty. Got in my sleeper at 9.45. Saturday September 19th 1925 Had a good nights rest. Breakfast at St Paul. Was put on my train. The Oriental Limited at 11.15. A beautiful train. The dining car service good. Weather pleasanter. Wrote Hattie. Sunday September 20th 1925 Was in the Observation part of the day. When we came through Montana there was snow on the ground. The air delightful. Came to Glacier Park at dark. Was of on the platform awhile. Went to bed early. Monday September 21st 1925 We were at Spokane when I woke up. The ride through eastern Washington not so pleasant. A desert region. But later as we went through The Cascade Range and along The Columbia River it was wonderful. Reached Tacoma about nine oclock and went directly to The Park Hotel. Had a comfortable room and soon ready for bed.